9 Inventions That Revolutionized Artmaking, from Paint Tubes to Neon - smARTravel - we guide you! 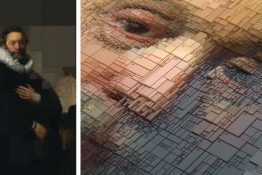 The creation of art has, since its beginnings, been determined by what tools, techniques, and mediums are available to artists. 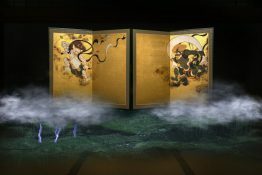 While many inventions have made artmaking easier and available to all, others have ushered in radical concepts and new understandings of how we define “art.” Some artistic innovations from centuries ago are now so deeply ingrained in the modern consciousness; it is hard to imagine what art would be without them. Below we share the brief history of nine inventions that, whether historically, practically, or conceptually, have changed artmaking for good. "Venus of Dolní Věstonice". Photo via Wikimedia Commons. One of the oldest forms of art, ceramics have been embraced for millennia by dozens of cultures the world over, and the practice continues to flourish today as contemporary artists make their own impressions on the medium. This wide-ranging art form would not exist, however, if not for the prehistoric humans who witnessed what happens when clay is placed in a fire pit. Unknowingly, they invented the first ceramic kiln. 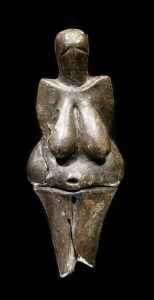 While it is not known who these people were, or when exactly they made this discovery (though the oldest extant ceramic figurines, like the Moravian Venus of Dolní Věstonice, date to between 29000 and 25000 B.C. ), their “pit kiln” is the earliest known type of the furnace used to make ceramics. Enclosed kilns would emerge among ancient civilizations; Ancient Greek kilns typically had a two-chamber design that directed smoke upwards, while Roman kilns were equipped with pipes, and some could hold up to 40,000 vessels. By 200 A.D., Chinese artisans in the Han period had developed equally massive “dragon kilns”—also called “climbing kilns” because of their steep slope along hillsides—that contained multiple chambers. These kilns produced the world’s first porcelain objects, and with them, China became the global centre of ceramics. The kiln’s design (along with porcelain) spread throughout East Asia and eventually reached Europe. While many dragon kilns still operate today, they have largely been phased out by electric kilns, which were invented in the 1920s by Brown-Boveri Ltd., a Swiss engineering company. Smaller in scale, safer to use, and easier to transport, electric kilns can be found in studios and schools, and have largely contributed to the thriving of ceramic artists today. The process of colouring glass with metallic oxide powders, otherwise known as stained glass, is most commonly associated with Gothic cathedrals. However, it probably has its roots in Ancient Egypt—specifically with a group of colored glass beads that were created around 2700 B.C., which are thought to be the earliest known example of fabricated glass. By the first century A.D., Romans were glazing glass panes for residential windows, though they were uniform in colour and somewhat opaque. Stained glass windows as we now know them—with multiple panes of luminous colours—were pioneered by Christians in the 1st century A.D., likely in the English town of Jarrow. In the 1970s, one of the oldest known pieces of multicolour stained glass were discovered at the town’s St. Paul’s Monastery, which formed in the year 686. Muslims were also using stained glass as early as the 8th century, as evidenced by Persian chemist Jabir ibn Hayyan’s writings on 46 glass-colouring techniques in the Book of the Hidden Pearl. By the Middle Ages in Europe, stained glass was both a refined art form and a religious phenomenon: Not only did its brilliant properties create a divine experience for churchgoers, it also provided a platform for Christian imagery. The oldest known surviving figurative piece of stained glass, which pictures Christ, dates to the 10th century and was found at the Lorsch Abbey in Germany. The ever-extravagant cathedrals of the Gothic age ushered in highly detailed and richly colored stained glass windows, often representing biblical scenes. 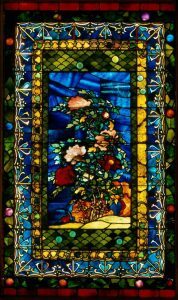 While its peak was in Gothic Europe, stained glass has had its own renaissance in more recent years, popularized in 19th-century America by Louis Comfort Tiffany’s Art Nouveau lamps and John La Farge’s opalescent windows. 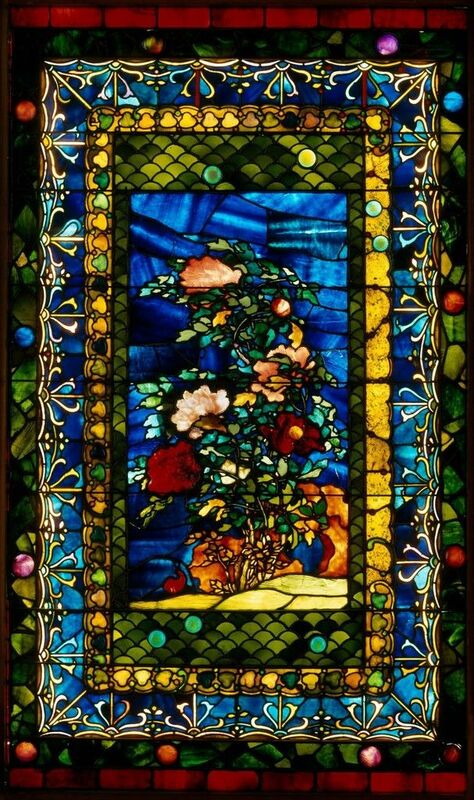 Throughout the 20th century, artists like Henri Matisse, Theo van Doesburg, and Judy Chicago all tried their hands at stained glass. And in 2014, Kehinde Wiley began working on his radical stained-glass series that places contemporary black figures before cathedral-esque panes designed by Jean-Auguste-Dominique Ingres, subverting the connotations of white Christianity that stained glass inherently evokes. Frontispiece for "Diamond Sutra". Photo via Wikimedia Commons. The Tang dynasty, widely considered a golden age of Chinese art and culture, ushered in many cultural innovations from 618 to 907, but the most consequential was woodblock printing. 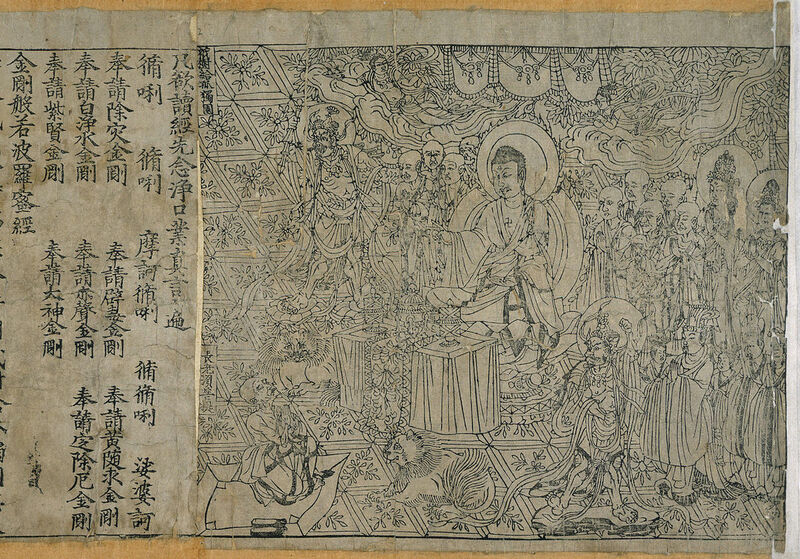 The technique—which involves carving into a block of wood, then adding ink to portions of it, before pressing it into paper—was initially used for replicating Buddhist texts, but the occasional image was made, as well. 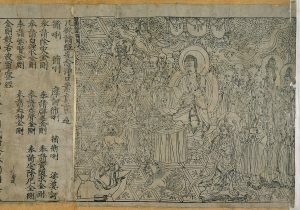 The earliest known example of a woodblock print artwork is an illustration for the Diamond Sutra from 868. And in Japan, although people had used the technique for centuries to produce texts, artists there did not begin using woodblock until the 18th century. In 1765, Suzuki Harunobu developed his own technique of multiple-block colour printing, a process called nishiki-e; before then, prints were usually colored with vegetable dye. Soon, brilliantly hued depictions of geishas, kabuki actors, and city scenes appeared, all rendered in a style known as ukiyo-e and pioneered by artists like Utagawa Hiroshige and Katsushika Hokusai (who famously made The Great Wave, c. 1829–33). Ukiyo-e prints were made in the thousands and sold on the streets of Edo for just a few cents—quickly making woodblock prints some of the most popular art in Japan. If you were a painter back in the early Medieval days, you’d have to separate your precious pigments into several bowls and line them up along your workspace, running the risk of accidentally mixing paints (and evidently, having lots of dishes to wash). This inefficiency evidently led to the development of the artist’s palette, which offered painters greater mobility and productivity in their craft. Though it’s not exactly known when it was invented, some of the oldest known depictions of the palette—a flattened hand-held surface, traditionally made of wood, for arranging multiple oil colours—come from De Mulieribus Claris, a 1374 collection of famous women’s biographies by Italian scholar Giovanni Boccaccio. Several illustrations throughout the book show women painters at work accompanied by a small, wooden disc with blotches of paint on top. One lady, deep in focus on a self-portrait, has a palette upon her desk in the shape of a nine-pointed star; it appears again, this time held, as she works on a Madonna and Child composition. By the 16th century, the now-ubiquitous kidney bean-shaped palette design—complete with a hole for the thumb—had emerged, as seen in an engraved portrait of Flemish painter Hans Bol, where the finely dressed gentleman poses with his (likely just-used) palette. Rectangular palettes were also used among Flemish painters such as Dirck Jacobsz, who included one in a 1550 portrait, as did Dutch Mannerist painter Joachim Wtewael in a self-portrait from 1601. 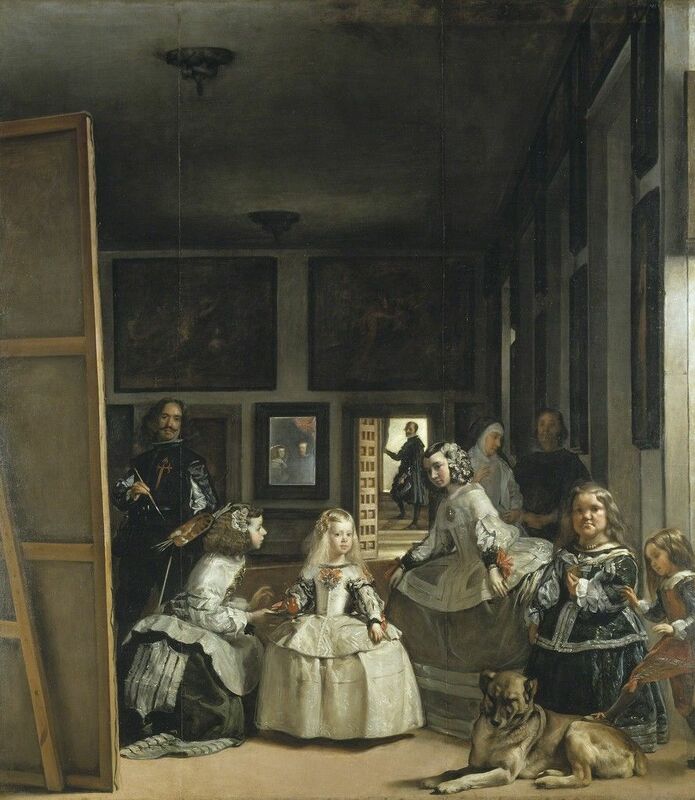 Nearly all early representations of the palette came from Northern Europe, but we know from Artemisia Gentileschi’s Self-Portrait as the Allegory of Painting from the 1630s and Diego Velázquez’s seminal 1656-group portrait Las Meninas that it reached other parts of Europe by the mid-17th century. Very little has changed about the classic artist’s palette since, other than the more recent introduction of materials like plastic, acrylic, and safety glass as alternatives to wood. 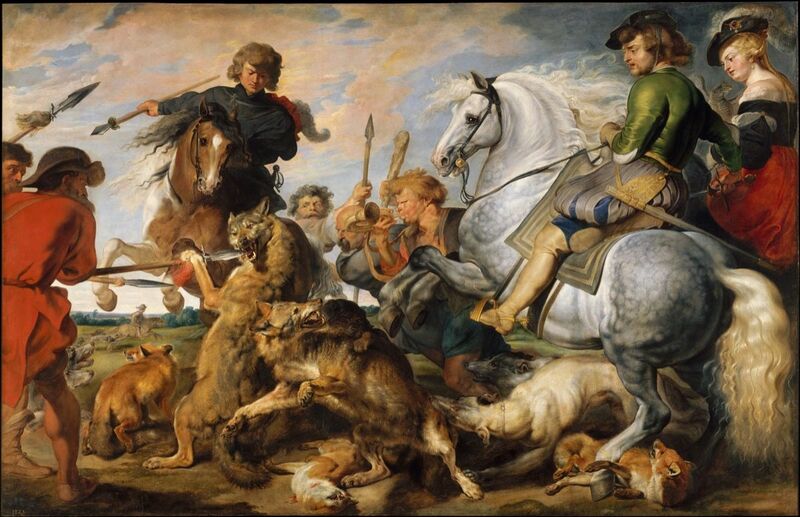 Peter Paul Rubens, "Wolf and Fox Hunt", ca. 1616. Courtesy of The Metropolitan Museum of Art. Originally introduced in 14th-century Italy as a more affordable alternative to wood panel, canvas consists of strong; tightly woven fabric that is often primed with a paint binder called gesso and stretched across a wooden frame. Though a smoother surface and lower price points have made canvas the most popular support for painting today, it took centuries to catch on—perhaps because most Renaissance art was made for (and funded by) wealthy families who preferred to decorate their homes in the city, often visited by nobles and scholars, with lavish panel paintings. Works on canvas, meanwhile, were viewed as less significant, and thus reserved for secular paintings to be hung in private summer properties; Sandro Botticelli painted his mythological tempera-on-canvas masterpiece The Birth of Venus (c. 1486) for the Medici’s Villa di Castello in the hills of Tuscany. 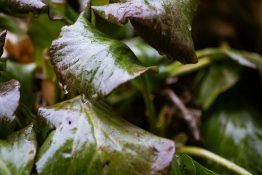 By the 16th century, Italian artists and their patrons started to realize that wood is prone to decay, and canvas became the ideal surface for painting. The best quality canvases came from Venice and eventually spread to Northern Europe, where they slowly overtook the panel tradition that had reigned supreme for years. Even staunch panelist Peter Paul Rubens painted works on canvas. His first experiment with the surface, Wolf and Fox Hunt(c. 1616), helped popularize canvas in his native Flanders, and by the 18th century it had become the de facto support for painting. Canvas painting in the 20th century was marked by experimentation and destruction. In mid-1940s Buenos Aires, Madí artists Gyula Košice, Carmelo Arden Quin, and Rhod Rothfuss began toying with conventional Western art practices by painting abstracted forms upon irregularly shaped canvases, a practice pursued further by American painters Frank Stella, Richard Tuttle, and Ellsworth Kelly in the ’60s. In the meantime, during the ’50s, Abstract Expressionist artist Helen Frankenthaler soaked unprimed canvas with turpentine-thinned oil paint, making the two materials fuse together into one (something she also owed to the invention of the paint tube). Yet no artist was as radical in their treatment of canvas as Lucio Fontana, who literally took knives to his surfaces beginning in the late 1940s, and continued working in this manner until his death in 1968. The artist explained that with these works he did not intend to create paintings, but rather to introduce new dimension to art. Nicéphore Niépce's, "View from the Window at Le Gras". Photo via Wikimedia Commons. Technically, the world’s first “camera,” the camera obscure, is thousands of years old. The concept of the camera obscure—which involved projecting images through a pinhole in a darkened room—was understood by ancient scholars and formally developed by Islamic polymath Ibn al-Haytham in the 11th century. But, of course, it could not truly capture an image like cameras we use today. The first camera that resembles the modern-day device has its roots in an experiment conducted around 1826 by French amateur scientist Nicéphore Niépce. While playing with his camera obscure—which by then had become portable—Niépce tried placing a bitumen-coated pewter plate inside of it, and left it before a second-story window in his home for eight hours. 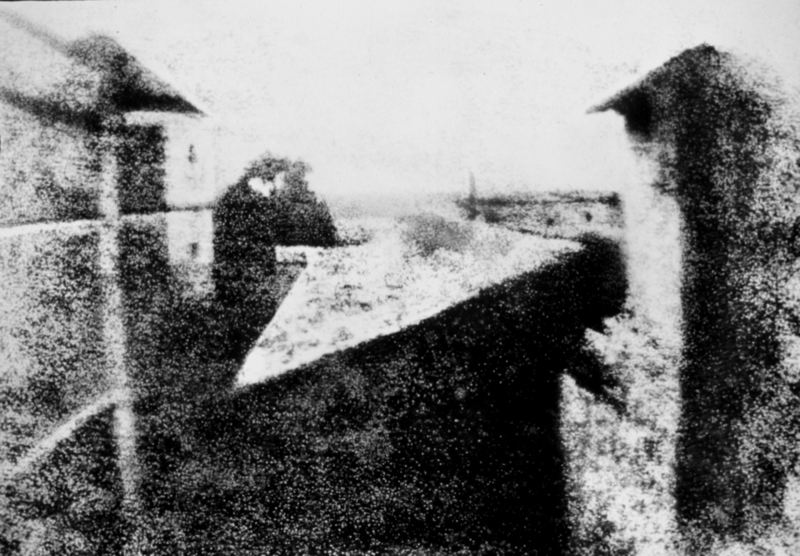 Afterwards, as he washed the plate, pieces of bitumen that were not hardened by sunlight began fading away—and Niépce was left with the first-ever photograph, capturing the upper-floor view of neighbouring buildings and a distant landscape. In the nearly 200 years that have passed, the camera has seen countless improvements: William Henry Fox Talbot’s 1841-patented negatives allowing for multiple prints; George Eastman’s invention of rolled film in 1889, and his Kodak company’s introduction of colour photography in the mid-1930s; the first Polaroid in 1947; the first point-and-shoot autofocus camera in 1978; and the rise of the digital camera in the 1990s (and beyond). Today, cameras have become so small that they are embedded in our cell phones and laptops. But perhaps the most crucial development the camera has had on artmaking has been the art world’s gradual acceptance, and eventual adoration, of the work it produced. As one of few mediums introduced into the art-historical canon at a relatively recent stage, it took quite some time for photography to even be considered art. Thanks to boundary-pushing photographers like Alfred Stieglitz, Diane Arbus, and William Eggleston (to name just a few), and the institutions that exhibited them before it was fashionable, photography went from a low-brow commodity into a leading art form by the end of the 20th century. And it all traces back to two French people playing with a camera obscure. Claude Monet, "The Bridge at Argenteuil", 1874, National Gallery of Art, Washington D.C. It is well known that the Impressionists revolutionized painting at the end of the 19th century, bringing the dawn of modern art with them. 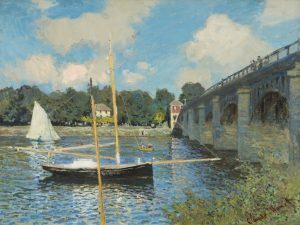 But art lovers have to thank someone other than Claude Monet, Pierre-Auguste Renoir, Edgar Degas, and the rest of that Parisian circle, for their contributions to art history: an American portrait painter named John Goffe Rand. Although he died in 1873, the year before the group’s first exhibition, Rand single-handedly (though indirectly) helped the movement come to life with his invention of the paint tube. In 1841, Rand had an epiphany: Small metal tubes would make storing paints simpler, cleaner, and handier, while increasing their longevity and portability. By March 6th, he had taken out patents on these “metallic collapsible tubes,” and they soon became a hit. With this ingenious invention, artists were able to bring however many shades of paint they wanted, wherever they wanted—whether that was a cafe, a garden, or an open field. The tube also let artists work in completely new ways, such as applying thick layers of paint directly from the tube. But the paint tube was revolutionary even beyond Monet’s France, improving painting for artists everywhere. In 1904, British chemist William Winsor added a screwable cap to Rand’s tube, allowing painters to save colours for later use. Pigment experts could then produce and sell paints in bulk without fear of them drying out, thereby making the medium cheaper. These mass-manufactured paints also had more even consistency, which could be thinned down with material such as turpentine—enabling further experimentation among artists, like Frankenthaler’s inventive soak-stain technique in the 1950s. Written language is estimated to be some 5,000 years old. But the dawn of the typewriter, and later the keyboard, transformed artists’ usage of the written word in their work. Between the developments of artist’s books, painted typography, and the rise of Conceptual Art, this invention further expanded what artists could do, and what art can be. While the first mechanical typing devices date back to as early as 1714, the modern “QWERTY” keyboard was patented by American inventor Christopher Sholes in 1868, and soon after, the first commercial typewriter was on the market. Revolutionary, yet extremely heavy and not so user-friendly, the typewriter did not change much until IBM introduced its Selectric typewriter in 1961, a more compact (and in keeping with ’60s style) update to the now century-old device. IBM continued to improve upon their product leading up to the computer age, by which point the keyboard—its modern name—became ubiquitous. With these new devices, forward-thinking artists could move beyond antiquated handwriting and use mechanized text in their work. Conceptual artists were naturally drawn to the typewriter’s capabilities, especially Joseph Kosuth. His incorporation of machine-written dictionary excerpts into his “One and Three” installations beginning in 1965, and later deeming those definitions themselves as art in his “Art as Idea as Idea” series from 1966–68, challenged the centuries-old belief that works of art need to come from the creator’s own hand. Conceptual artists like Lawrence Weiner and Barbara Kruger would form their entire practices around typewritten text (the latter is particularly fond of Futura). The ’60s also witnessed artists’ first experiments with painting words onto canvas so precisely and consistently that they mimicked what a keyboard could do. In 1966, Japanese artist On Kawara began Today (1966–2013), in which he painted the current date in uniform block lettering, eventually accumulating to some 3,000 works over nearly five decades. Around the same time, Ed Ruscha started exploring similar concepts from a West Coast-informed Pop Art lens, beginning with works like the oil-on-canvas OOF(1962). A few years later, he made an artist’s book—itself a new form of art pioneered by Ruscha and aided by the typewriter—called Royal Road Test(1967), filled with pictures of the artist and two companions chucking a vintage Royal typewriter out of a speeding car. Ruscha was not nearly done with typographic work, however: In 1980, he designed his own font called Boy Scout Utility Modern, based upon the lettering style seen throughout his oeuvre, which he still uses today. But perhaps no artist’s work is as synonymous with the keyboard as that of Jenny Holzer. Her text-based “truisms”—statements on feminism, social injustice, and the complexities of being human—began in 1977, when Holzer typeset her one-liners in alphabetical order and printed them on cheap commercial paper, hanging them up around New York City. This radical body of work has since appeared around the globe on scrolling LED signs, theater marquees, marble benches, billboards, massive building projections, and beyond. 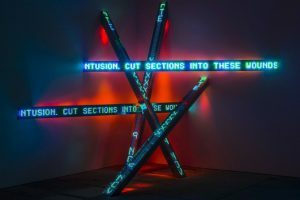 Over the latter half of the 20th century, artworks made from neon and fluorescent light have increasingly appeared in museum collections, and have been central to art movements such as Light and Space. The media themselves were both born of the 20th century, as well: The first neon lamp was invented in around 1902 by French engineer Georges Claude, and the first fluorescent lamp in 1926, by Edmund Germer in Germany. However, neither neon nor fluorescent light—the former made of thin, bendable glass tubes whose colours are determined by gas mixtures; the latter made of long, straight tubes with more limited colour options—would cross the commercial-to-fine art threshold for some decades, until Gyula Košice (of the aforementioned Madí movement) incorporated neon into works like Estructura lumínica Madí 6 (1946), marking the first time an artist used such a medium. 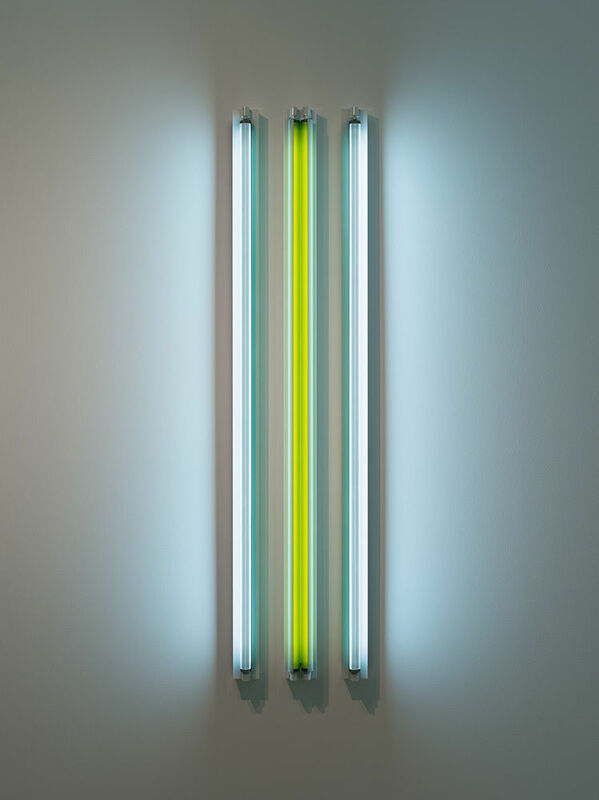 Artists of the 1960s and ’70s, like Dan Flavin, Robert Irwin, and Bruce Nauman, are most commonly credited with bringing neon and fluorescent light into the realm of fine art—yet it should be noted that while Flavin and Irwin only worked with fluorescents, their work was still instrumental in introducing commercial light as a possible art form. 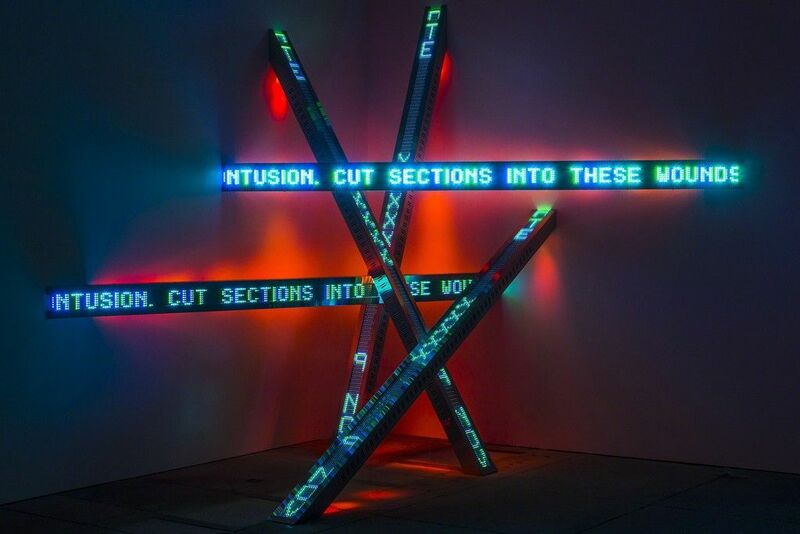 Since then, artists from Keith Sonnier to Tracey Emin to Iván Navarro have created brilliant works of art from neon and fluorescent light, and institutions—like Dia:Beacon in upstate New York and the aptly named Museum of Neon Art in Glendale, California—have mounted permanent displays of these illuminating artworks.